XSYTE Sports Websites - Run great pick-up hockey sessions! Running successful pickup games can be difficult for the organizer. It is a struggle to get the right amout of players. Too few and you lose money and might not even cover the cost of the session. Too many and people are complaining about not getting enough time to play and may not attend future games. Chasing up player commitments to ensure a well-attended game can be an endless, time-consuming struggle. That's where XSYTE comes in... using the Game Invitation System makes it easy to run successful pick-up games time after time with the ideal amount of players to ensure a great game. Organizers no longer need to waste their valuable time sending emails and text messages or calling players to see if they are available. The Game Invitation System takes care of all of these tasks with the click of a button. 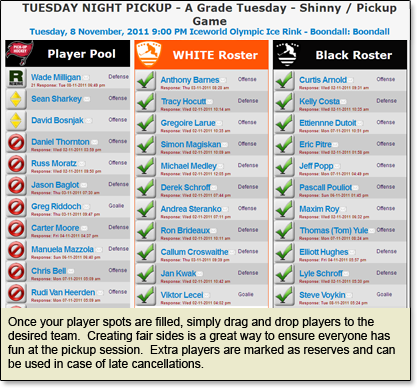 Here's how it works...Let's imagine a scenario where the ideal number of players for each pickup game is 20 players plus 2 goalies. You put all your potential players into a player pool. You can add players manually or they can request to be added via the website where you can activate them, automatically adding them to the pool. This helps grow the number of available players, increasing the chance for a full pick-up session. 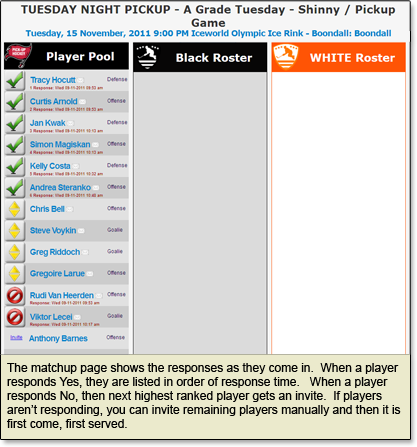 You can rank your players to be sure that desired players are first to get an invitation. Now all you have to do is go to your game page and click Send Invites! Then just kick back and watch the magic happen. 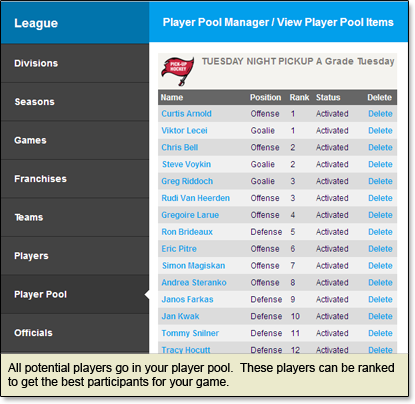 The first 20 player invitations plus 2 goalie invitations are sent automatically. As the players respond, the game page updates indicating what the responses are. If a player indicates "Yes", then he/she will get a big green tick next to thier name letting them know they are in. "Yes" players are listed in the order of response time. 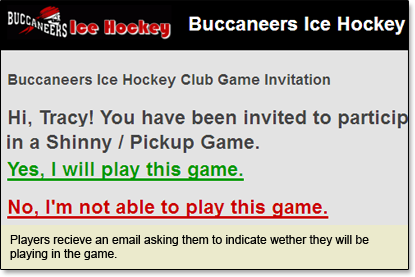 If a player indicates "No", then an invitation gets sent out to the next person in line. Sometimes players won't respond. In this case you can manually invite players still waiting for an invitation. At this point it becomes first come, first served because you will have more invitations out than are spots left in the game. After you fill up the 20 spots, further "Yes" indications are marked with an R - Reserve icon instead of a green tick. This lets players know that they are not in the 20, but may still be able to play in event of a cancellation. Once your spots are filled, you can simply drag and drop the players to the desired team. Setting up fair teams is a great way to build a fun pickup game that everyone will enjoy. It also lets the players know what jersey to bring to the game!